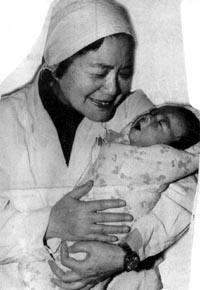 Zheng Mengzhu 郑萌珠，the first test-tube baby of China was born on March 1988 in the No. 3 Hospital affiliated to the Beijing University of Medical Sciences. The 19-year-old girl is to enter Xijing Vocational Institute in Xi’an, capital of the northwestern Shaanxi Province in the fall semester starting next week. It was said her parents had been trying for nearly 20 years to have a child and Zheng’s mother became pregnant at the age of 39 by test-tube technology. Zheng Mengzhu was born with weighed 3,900 grams at birth, 10 years later after the world’s first test-tube baby Louise Joy Brown who was born in July 1978 in Britain. Louise has gave birth to a naturally conceived boy last year. School authorities refused to comment anything about Zheng Mengzhu in order to protect her privacy. This entry was posted on Friday, August 31st, 2007 at 4:04 pm	and is filed under Interesting Stuff. You can leave a response, or trackback from your own site.